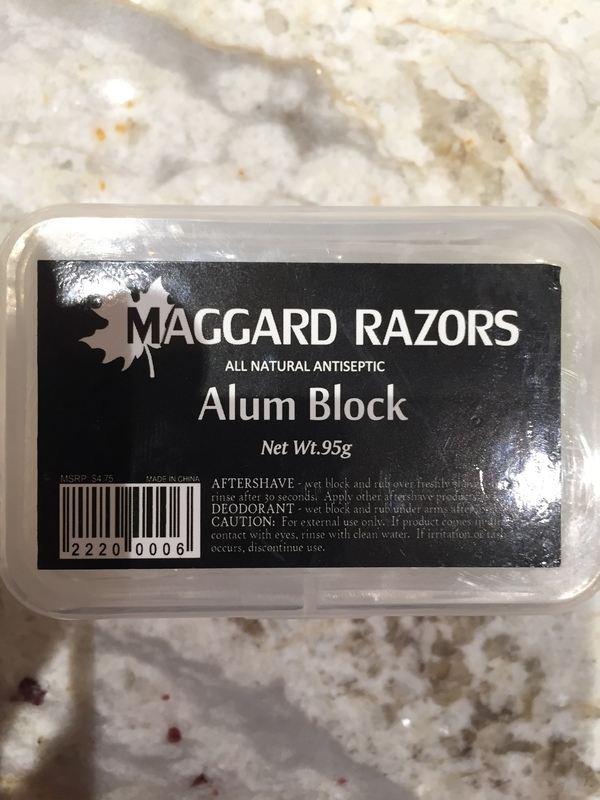 I know alum blocks are normally sold as a post shave product. I love them. However, I don't use them as a post shave treatment. They make the best underarm deodorant I have ever used. It kills the bacteria that causes odor, but doesn't stop the body from perspiring. Just curious if anyone else uses alum blocks as an underarm deodorant? I use Osma block on my face and Razorock under my arms. The Razorock most resembles the shape of an underarm deodorant. I regularly use the same alum as @Barrylu described. However, I don't use the RazoRock alum stick, or any alum, as a deodorant. Instead, I keep it on the counter during my shave so that I can touch the stick if my fingers holding the razor start to get slippery. Also, I really enjoy using the Osma alum block and a cold water rinse on my face after the shave, whether or not the shave went smoothly. I did try it, but it didn't work as well as my normal antiperspirant deodorant. I'm sure I could use it in a pinch, but I'm happy with the Right Guard. PUse Alum as a deodorant only, works really well. There are two types of alum: for the face potassium alum; for the underarms (not the face) the ammonium alum, but I wouldn't use the latter for either. (10-16-2016, 10:29 PM)Shaun Wrote: There are two types of alum: for the face potassium alum; for the underarms (not the face) the ammonium alum, but I wouldn't use the latter for either. I posted in that thread linked to. I have now been using the ammonium based alum for 3+ years without problems. That said the milder potassium based alum might suit more people especially if you have sensitive skin. I will say that I have always had oily skin and suffered from pimples all my life. After using alum post shave the pimples are no longer a problem. Wish I had of discovered that before turning 60. I have always used the OSMA blocks as the cost was like $8 for 2 big blocks. The only bad part to them is when they slip out of the hand and shatter! Right now I am using an RR one that has a plastic handle. So far so good; no whoopsie yet! Another thing alum works great for is canker sores. Of course, you might want to use a different block; or not. I used alum as a deodorant in the past and it worked very well, even in Miami's hot, humid weather. Just purchased a large block off Ebay yesterday. Almost a 4 oz block for $5.49 free shipping. Hope it fits in my case. I use it on my feet. No more smelly sneakers. Got this in mail recently and in very tiny lettering, "Made in China." No description given on e-Bay as to which type of alum. Absolutely! I bought "The Crystal" stick. Much better to apply than a block as it's in stick form and has a container for travel, although I still have an Omega that I actually use for travel because it's compact. I've used the blocks from the Indian markets, and they work just fine, albeit the texture is rough. At under a buck apiece they make more financial sense than the branded Crystal or Omega, but the format is just much more convenient. I do, everyday. They lasts a really long time and very inexpensive. I used to hate the way deodorants ruin some of my shirts. No problems like that anymore! woot! Got my Razorock Alum block w/case from Italian Barber. I have a block of alum that I bought at The Art of Shaving. I have never used it for deodorant. However, I do use it as part of my post shave routine to stop the bleeding of nicks. I also like the "stinging" that is felt as I rub it on my face. I use potassium alum for an aftershave, and, another, for deodorant. Osma, for aftershave, and, Crystal, for deodorant. I use them after the shave. I leave on the alum whole I wash my brush. Then I rinse it. The longer I keep it on, the better it does it's work. (06-05-2017, 02:14 AM)Quando Wrote: I use potassium alum for an aftershave, and, another, for deodorant. Osma, for aftershave, and, Crystal, for deodorant. I used Crystal Rock Deodorant, for years, before it started to leave a rash. I recently, in the past two weeks, switched to Speed Stick Musk, in combination with Crystal Rock Deodorant Body Spray, for my chest, elbows, and, knees. I think, I may start using it, on my feet, as well.